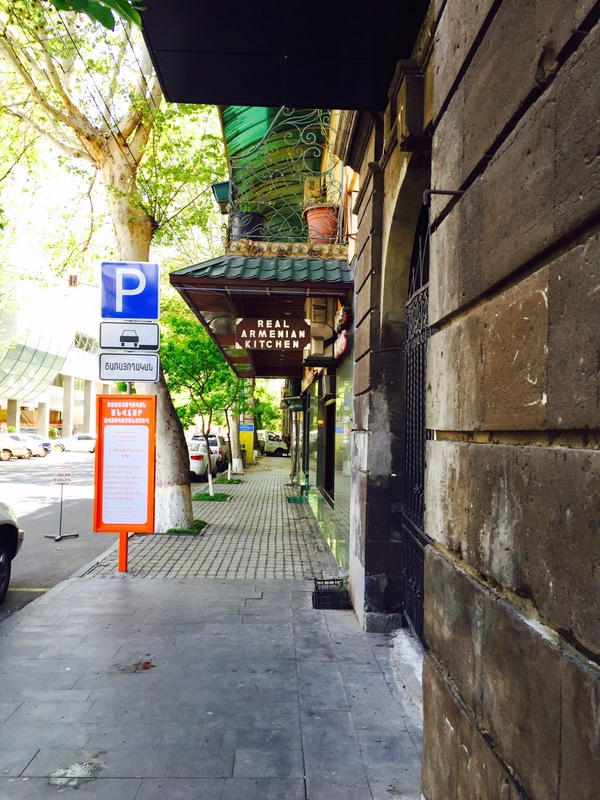 Selecting a good restaurant in Yerevan can be a tricky experience – just like anywhere else in the world. We rely on recommendations from friends, family, even strangers if they are locals-in-the-know in a foreign land. 1. Doug, Aram Aslanian and I had the good fortune of having our breakfast included in the cost of our hotel room at the Congress Hotel. 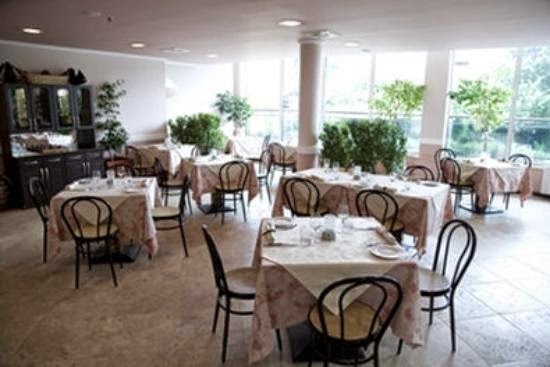 Each morning breakfast was served buffet-style in a bright, cheerful setting. Much to our delight, there was an omelet station, assorted fresh fruit, juices (including apricot nectar- our favorite! 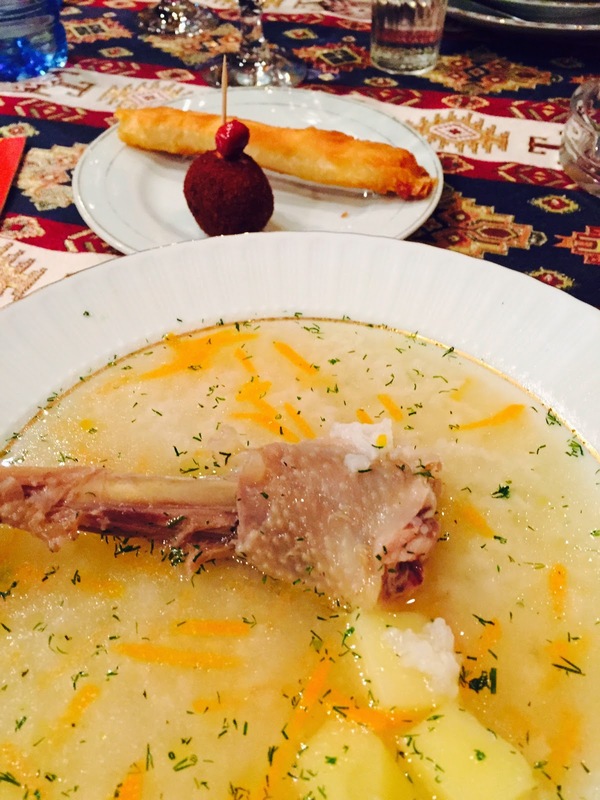 ), Armenian cheeses, yogurt and honey, breakfast meats, lavash, an array of pastries, plus too many other items to mention. This fueled us well for much of the day. Would we stay at the Congress Hotel again? Yes, indeed. 2. We ventured out to area establishments but found that some restaurants were geared to locals and others clearly for Western tourists. 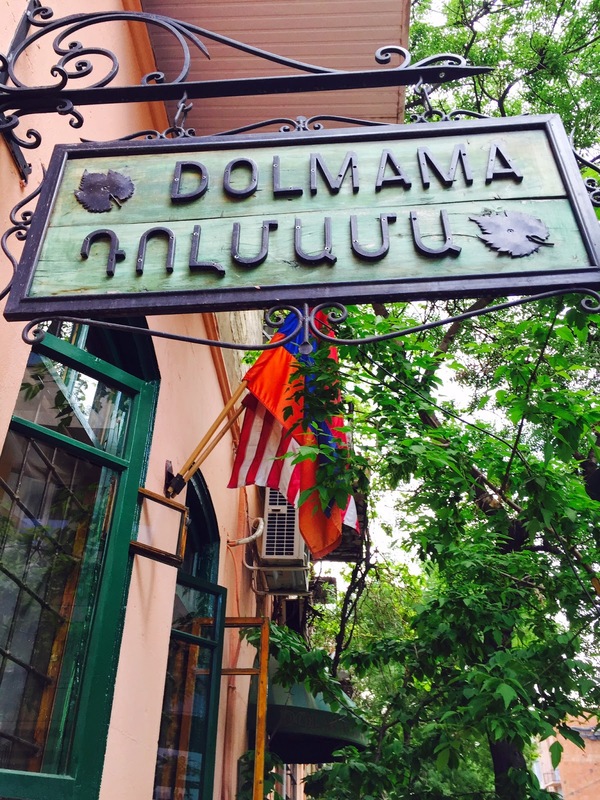 We’d heard about a place called Dolmama. Some swore by it; others said it was over-rated. Frankly, we loved it. The food was a feast for the eyes and the palette, but it was the piped-in music that spoke to us. Who would have thought that while dining in Yerevan one would be listening to the tunes of Barry White, Smokey Robinson, and the Temptations? As we left the restaurant, we noticed the Armenian flag on the outside of building flying right next to the American flag. I guess Dolmama knows who their customers are! 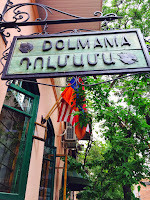 Would we dine at Dolmama again? For sure! 3. 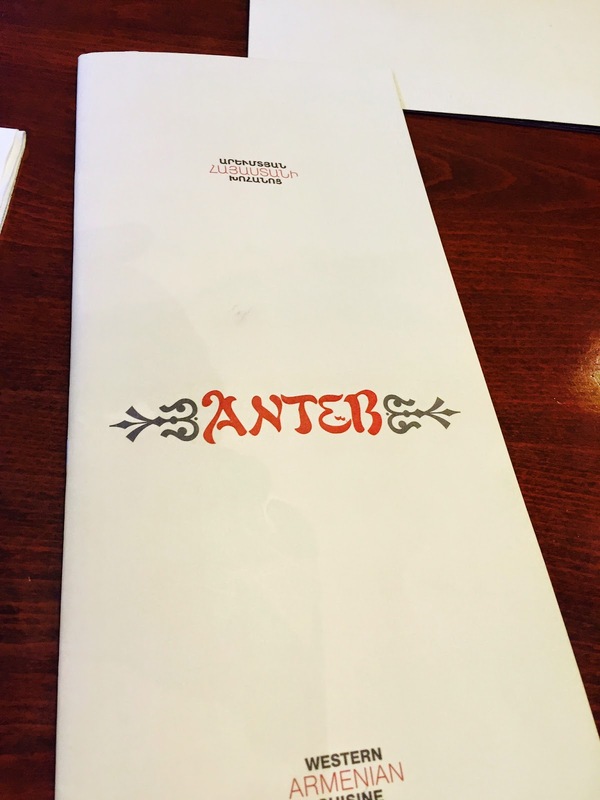 Another excellent dining experience was at the restaurant, Anteb, chosen by our friend Arman Avedian. 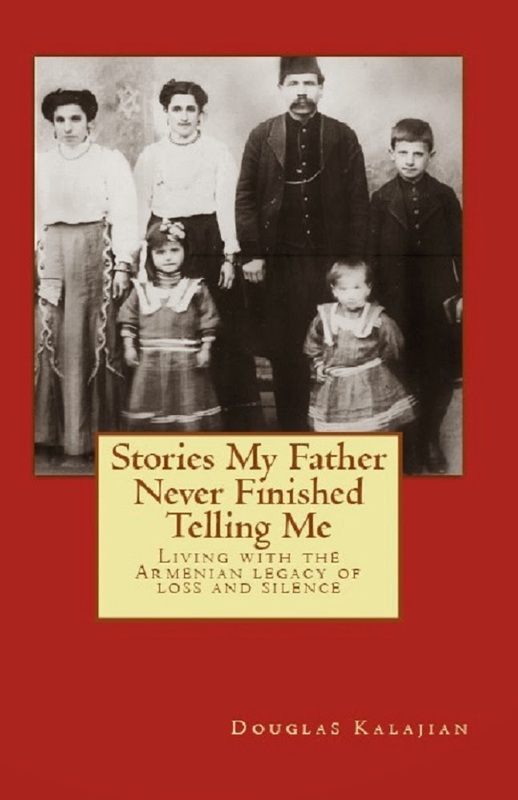 This place boasts Western Armenian cuisine, meaning they serve Armenian food we Americans can best relate to. 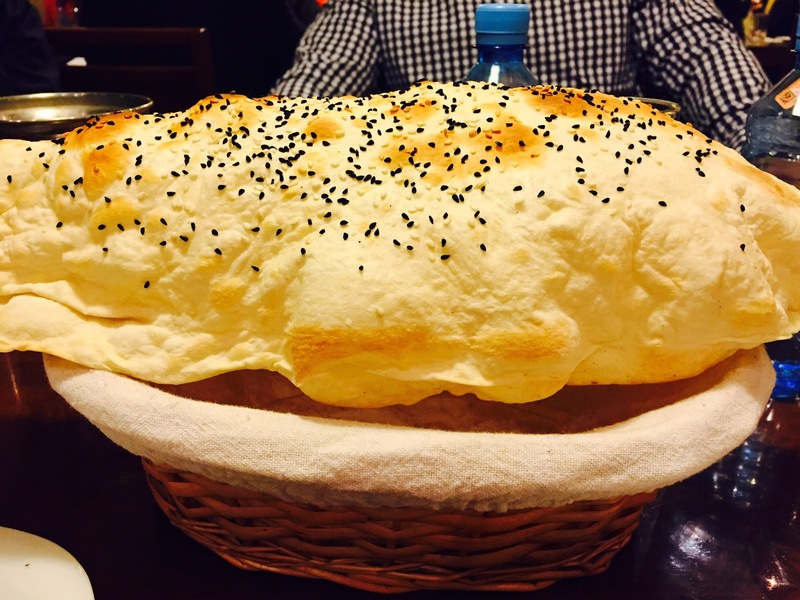 One specialty of the house is a type of lavash that comes out light and puffy – such fun to eat! 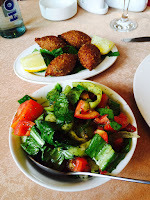 Their kufteh, lahmajoun – and everything else we ordered greatly satisfied us! 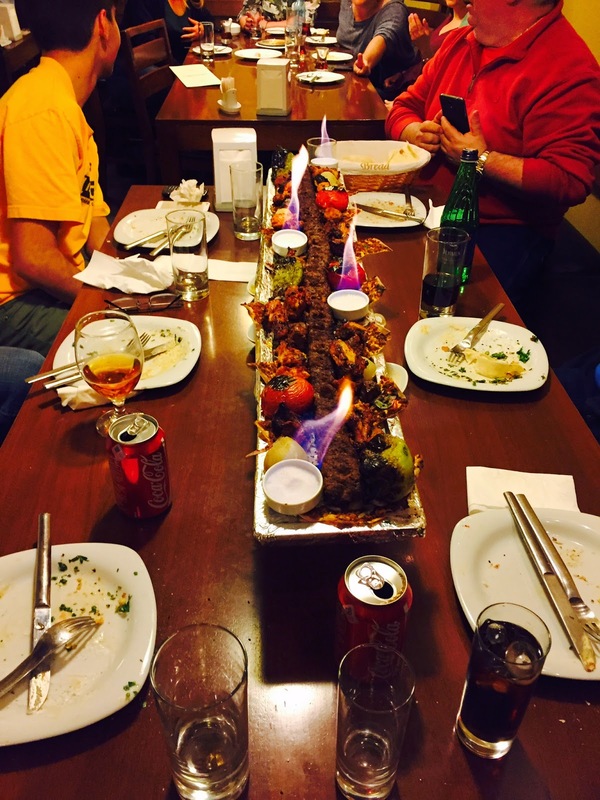 A group of diners at another table ordered lule kebab that was almost the entire length of their table – what a sight! They devoured it. 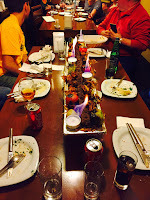 Extra-long lule kebab at Anteb! 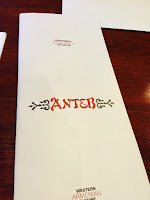 Would we dine at Anteb again? Absolutely! 4. A restaurant recommended by our tour guide was a place called Our Village which served food which represented different Armenian regions. The décor was rustic and the menu sounded enticing. 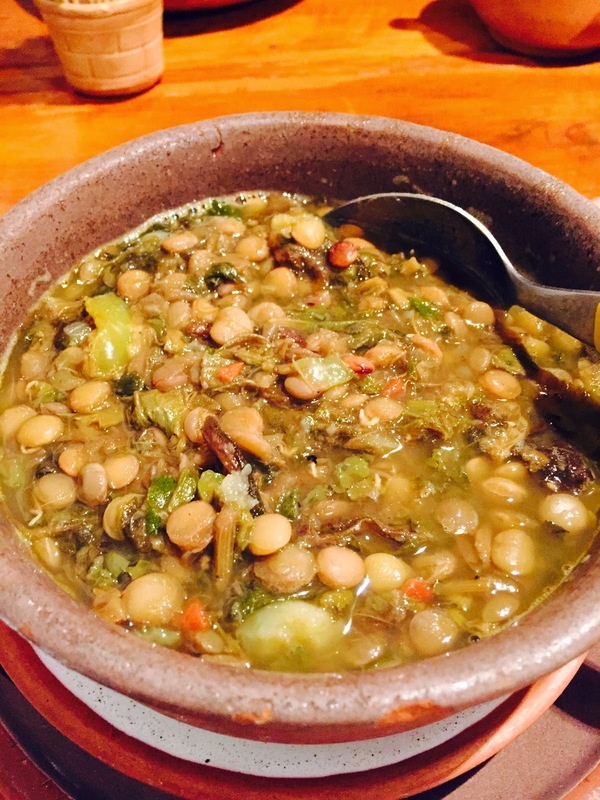 I ordered the Aveluk soup, which was a hearty, tasty combination of lentils, potatoes, and earthy herbs. 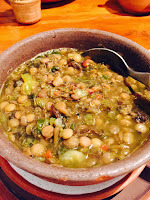 (Aveluk soup recipe will be a separate post.) 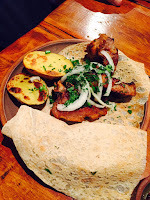 Doug and Aram ordered “barbequed” lamb and beef sandwiches which were served on sheets of lavash. They looked amazing. 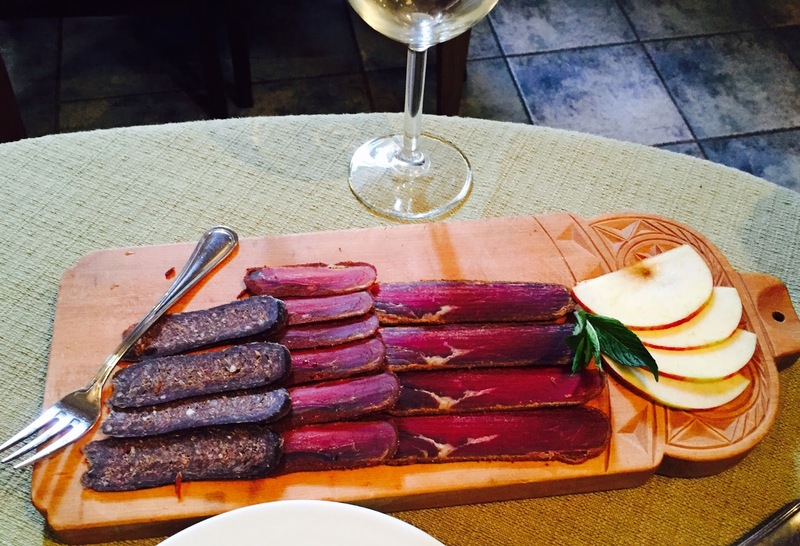 ‘Barbeque’ in Armenia apparently doesn’t mean the same as it does in the US. There was no hint of tomato- or - vinegar based sauce. In fact, there was no sauce at all. The meat was grilled, we think. Eating the sandwiches proved to be a jaw-breaking experience. Doug gave up; Aram persevered. On a positive note, the potatoes were delicious. Would we return? Not for the meat dishes, but everything else was good. 5. 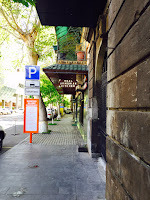 Right around the corner from our hotel was a restaurant whose name caught my eye - Real Armenian Kitchen! Peeking through the window, it looked like someone’s home dining room. We sauntered in, were seated, then realized no one here spoke any English. 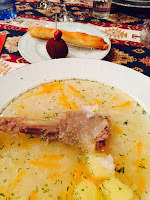 We were able to figure out a few things on the menu, and ended up with chicken soup and a few other tidbits. The soup arrived steaming hot with nothing more than the broth, a few potatoes, and a few green aromatics swimming around. It smelled wonderful, although it wasn’t quite what we expected. The main feature of the soup was its garnish …. a chicken leg or, rather, a hen leg. We looked forward to eating the meat but discovered it was tough stringy, rubbery and completely inedible! We left slightly hungry. 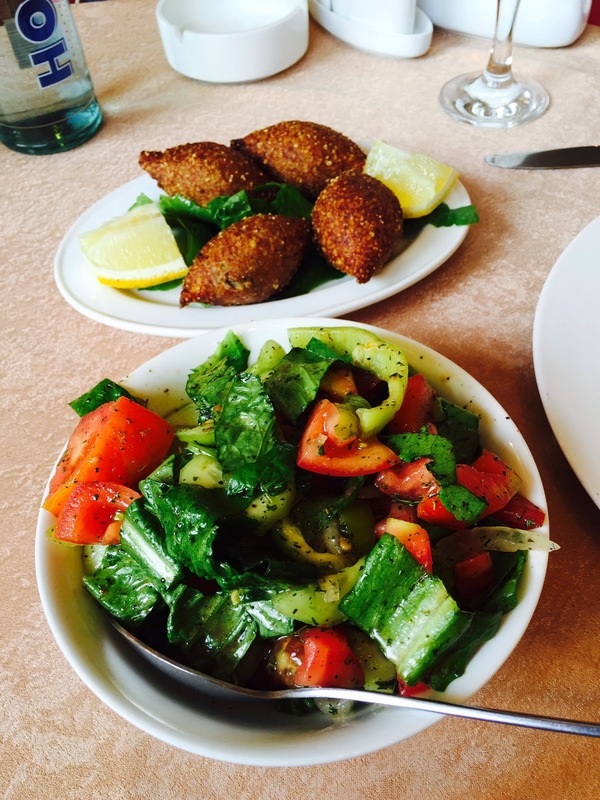 Would we eat at the Real Armenian Kitchen again? Only if we learn more Armenian so we know what to order! 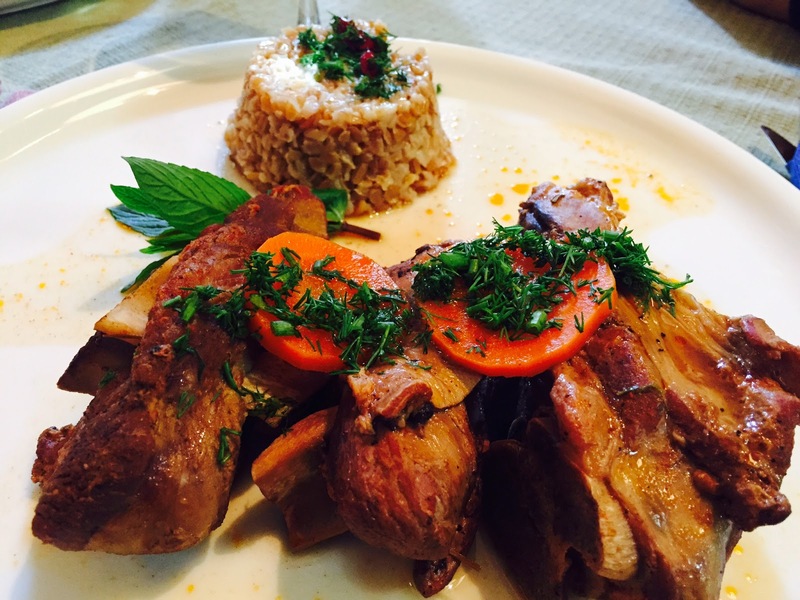 If you travel to Armenia, don’t be afraid to try food that may be new to you. Immerse yourself in the culture - completely, and with reckless abandon. You’ll be glad you did! 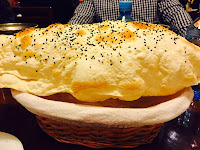 Enjoyed a wonderful, truly Western Armenian meal at Anted while visiting Yerevan in April. 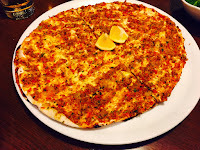 I found much of the "Eastern" food to be very heavily salted, but the seasonings and flavors at Anteb were perfect. 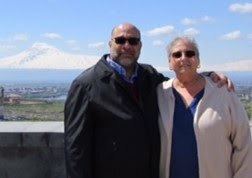 Thanks to Joseph Matossian for taking me to this delightful restaurant for one of the best meals I enjoyed during two weeks in Armenia!